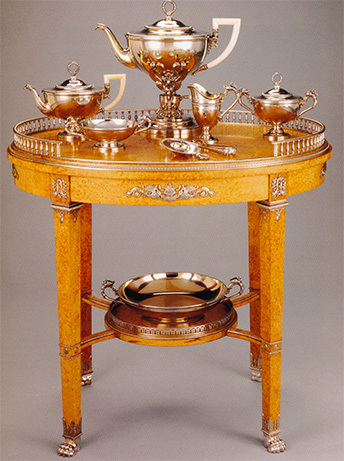 Tsarina Alexandra Feodorovna received this incredible Faberge creation, The Imperial Lilies of the Valley Basket, on the occasion of her husband’s coronation. 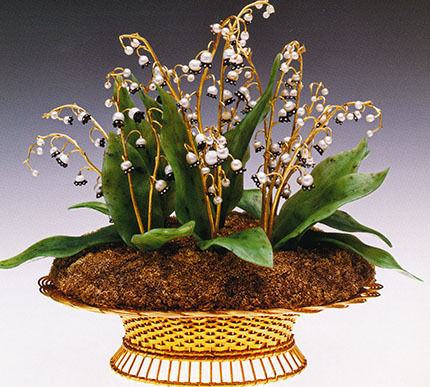 Shown at the Exposition Universelle in 1900 and today at the Legion of Honor is a delicate basket of lilies of the valley pearl and diamond flowers with jade leaves all nested in a basket of spun gold. 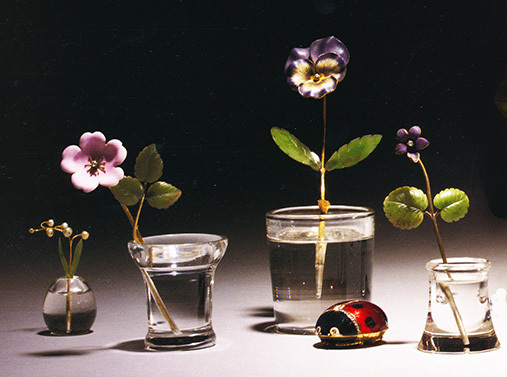 Grand Duchess Maria Pavlovna had a passion for Faberge’s flowers in vases created from gem hard stones, enameling and crystal. These beautiful flower bouquets helped to brighten the long winter days in Russia. 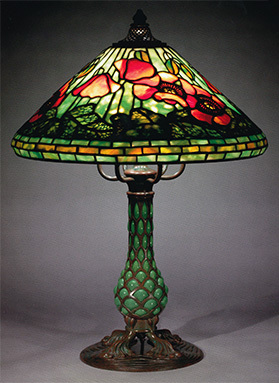 Russian mineral deposits of jasper, lapis, malachite discovered in theeighteenth century provided Faberge the materials to create miniatures of animals and heros. 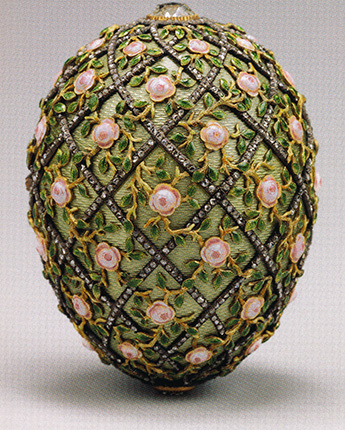 The Trellis Egg is one of my favorite eggs produed by Faberge. 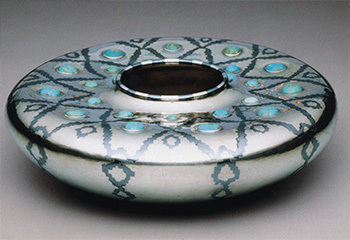 The different colors of the enamelling are more vibrant and rich in texture than any photographs can show. 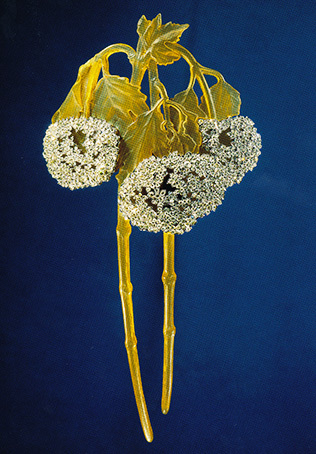 The Imperial Rose Trellis Egg was given to Tsarina Alexandra Feodorovna by Nicholas II in 1907. The workmanship in the trellis egg is intricate and difficult to produce because of the intense heat needed for the enamelling. 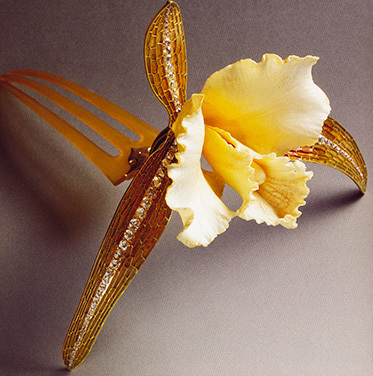 First the gold egg is handcrafted and guilloche engraved, enameled in a pale green, a trellis with small diamonds is applied and again pink enameled roses applied and leaves of gold added at the end of the process, all fused together with different melting points temperature of heat. 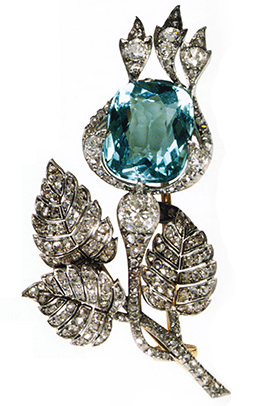 The surprise inside the egg was a miniature portrait of the Tsarevich on a diamond necklace. 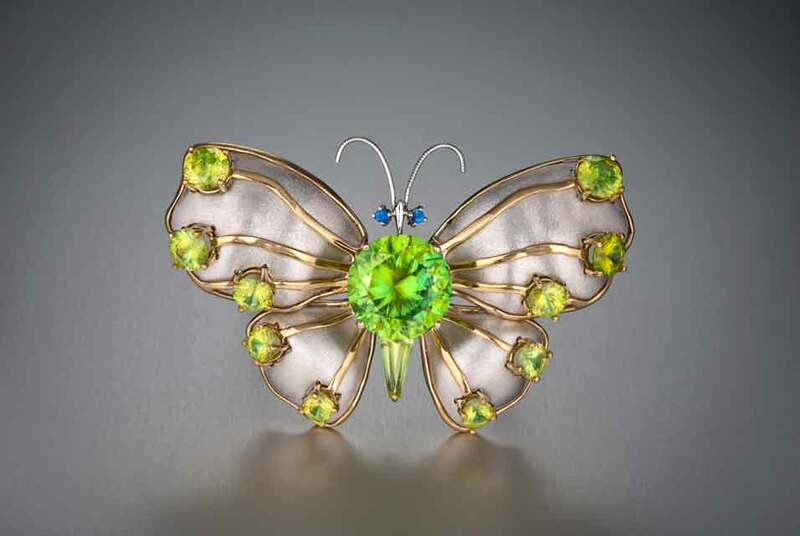 Rene Lalique, one of the most famous jewelers in France, was known for his extraodinary renditions of nature using materials ranging from precious diamonds and gems to non precious materials such as horn, shell and coral. 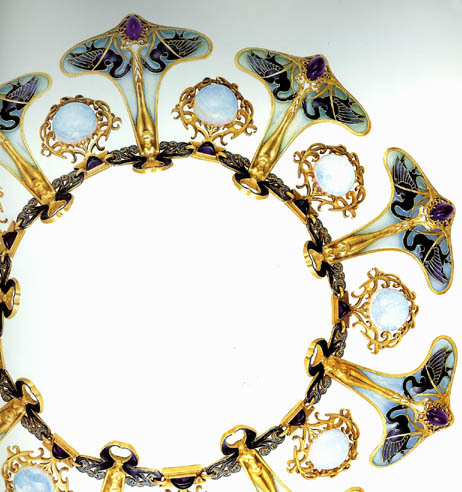 Lalique established his reputation first as a jeweler then moved exclusively into glass making as opposed to Tiffany who started in glass and eventually joining his family as a jewelry designer. 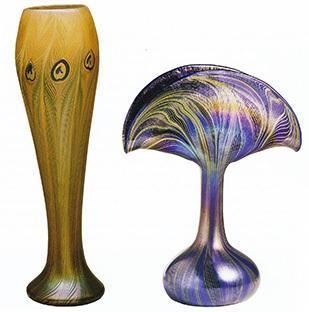 The work that Lalique created was enormous during his life. 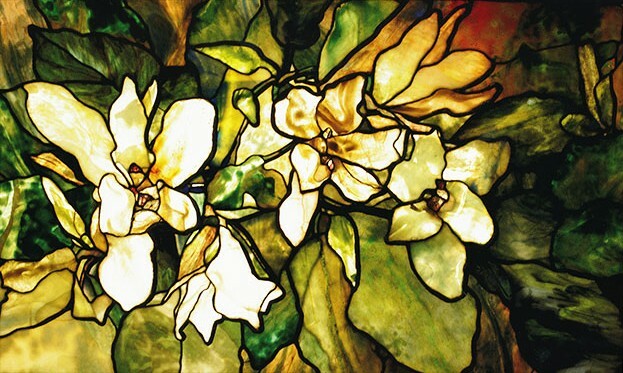 Several of the items that were in this exhibit were also displayed in the French Masters which I wrote about in another post.